Africare President Julius Coles said Fountain would help the organization achieve its goals for 2006, including securing additional funding sources and expanding Africare's reach to new countries. W. Frank Fountain served as a Peace Corps Volunteer in India from 1966 to 1968. Africare welcomed new board chairman W. Frank Fountain and celebrated the achievements of outgoing chair George Dalley at a reception Thursday hosted by Africare, the Corporate Council on Africa, the Leon H. Sullivan Foundation and Washington law firm Patton Boggs, LLP. Africare is the oldest and largest African-American organization devoted to Africa's development. Fountain, who had served on the national board before replacing Dalley as chair, is senior vice president for government affairs at DaimlerChrysler. "I will always be passionate about the opportunity the great continent of Africa offers," Fountain said. "The world will never realize its full potential until Africa realizes its full potential." Africare President Julius Coles said Fountain would help the organization achieve its goals for 2006, including securing additional funding sources and expanding Africare's reach to new countries. "Frank has already shown that he's a very skillful fundraiser," he said. Africare's former president C. Payne Lucas, who headed the organization for more than 30 years, also championed Fountain's leadership. "[Frank is] not only a corporate executive, but a former Peace Corps volunteer," Lucas said. "He becomes about the perfect candidate." Coles thanked Dalley for his leadership on the board, especially when Lucas retired in 2002. He said Dalley made the transition smooth and successful. "Without George, it would not have been possible," Coles said. "George has been a counselor, a man of wisdom." Dalley said Africare has proven itself a durable institution that will outlast any single person. "It is essential to have African-American leadership [on] U.S. policy towards Africa," Dalley said. "The diaspora still has so much to contribute to be a part of the future of Africa." 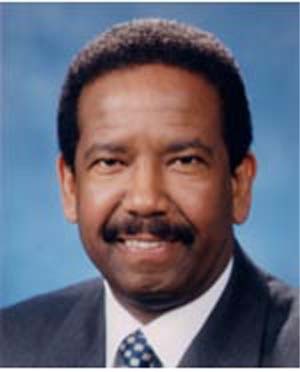 Dalley is chief of staff for U.S. Rep. Charlie Rangel (D-New York). He said he would continue to advocate for Africa's interests with members of Congress, especially the Congressional Black Caucus. From 1966 to 1968 W. Frank Fountain accepted a Peace Corps assignment to West Bengal, India to assist farmers in implementing new techniques for yielding higher volumes of rice crops. In his second year in India, Fountain aided a local farmer in growing the largest harvest of rice ever produced in his district. He also collaborated with the local handicraft industry to develop new marketing plans to expand their consumer bases. At the end of his Peace Corps assignment, Fountain was selected to stay in India for an extra month to pinpoint work sites for impending Peace Corps Volunteers. In 2004, Fountain was selected as senior vice president of external affairs and public policy of the Chrysler Group. He serves on numerous Boards of Directors, including: Charles H. Wright Museum of African American History, Africare, Detroit Public Schools Board of Education, and the Community Foundation of Southeast Michigan. Fountain holds a bachelor's degree from Hampton University, a master's in business administration from the University of Pennsylvania, and an honorary doctorate from Central Michigan University. Regarding his Peace Corps service, Fountain once said, "Most of the success that I have experienced throughout my career can be traced back to the intense, challenging, sometimes painful, but always inspiring experience in the two years in West Bengal, India." I am working for several NGOs working on indigenous people , Human rights violation and use of traditional knowldge sytem to improve livelihood by fusing both modern and traditional science. I request your donor support , guidance and training support to them under an NGO forum in this region of tribals. Here is my CV for your kind perusal and guidance.